911 or 211: Which one should you dial? Thousands of people are looking for help and resources as the remnants of Hurricane Florence continue to dump several inches of rain across North Carolina. If you or someone you know are in danger and need immediate emergency assistance you should dial 911. If you or someone you know needs information about evacuations, shelters, or help with food, water or other necessities you can call 211 or text "Florence" to 898211. 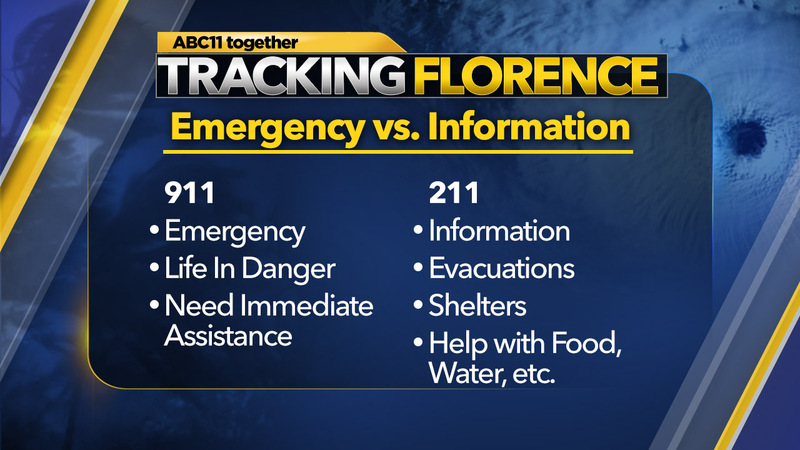 Emergency officials are urging people to only use 911 if there is a true emergency. They want to keep those lines open for people whose lives may be in danger.